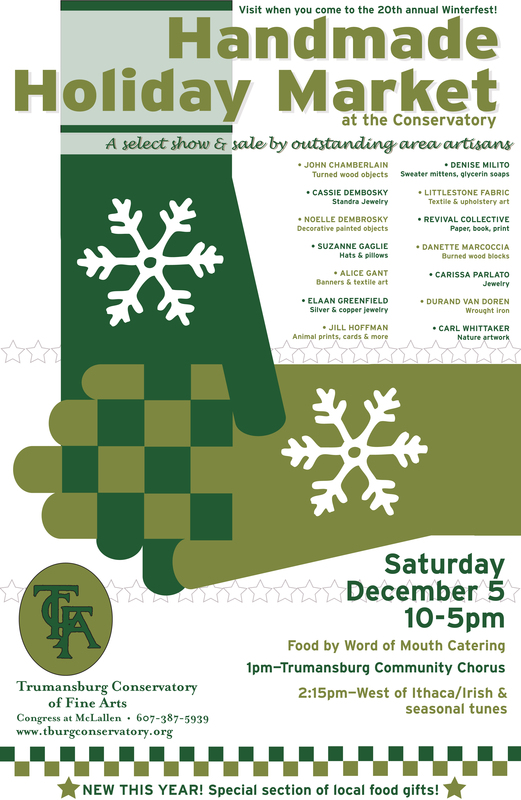 TCFA proudly presents the Handmade Holiday Market: A select show and sale by area artisans. The Market will take place in the Conservatory auditorium on Saturday, December 5, 10am-5pm, on the weekend of the Trumansburg village annual Winterfest. New this year at the Market will be an array of locally produced food gift items. The Market will also feature live music: the Trumansburg Community Chorus will perform (1pm) and West of Ithaca will play Irish and seasonal tunes (2:15pm). A simple delicious lunch will be provided by Trumansburg’s outstanding caterers, Word of Mouth. Admission to the show is free. Artisans include: John Chamberlain (turned wood objects), Cassie Dembosky/Standra Jewelry, Noelle Dembrosky (paintings/painted objects), Suzanne Gaglie (hats and pillows), Alice Gant (banners & textile art), Elaan Greenfield (jewelry), Jill Hoffman (animal imagery on cards, prints), Littlestone Upholstery Design (textile/upholstery art), Danette Marcoccia (burned wood blocks), Denise Milito (mittens, tile inlay, soaps), Carissa Parlato (jewelry), Revival Collective (paper, book, print), and Carl Whittaker (nature artwork, gliders). Food producers include: Celia’s Ice Pops (S’mores kits), Crooked Carrot (preserves), Hawk Meadow Farm (tinctures), Simply Maple (syrup, candies), Wide Awake Bakery (granola, cookies), and Vogel-Moore Honey.